THE STORY - One month every year, five highly competitive friends hit the ground running for a no-holds-barred game of tag -- risking their necks, their jobs and their relationships to take one another down. This time, the game coincides with the wedding of the only undefeated player. What should be an easy target soon becomes an all-out war as he knows they're coming to get him. THE GOOD - More than a few decent laughs. Genuine chemistry between the main group of actors. Cat and mouse suspense watching an adult's version of a child's game. THE BAD - Ridiculous storytelling for what is really a simple story. Some of the jokes don't land as well as others. Female characters are unfairly sidelined. ​​​Have you ever heard the phrase, "It's so crazy, it has to be true?" Well, that sums up everything you need to know about "Tag." Although, a brief bit of camcorder video footage featuring the real-life people towards the end of the film reveals that this Hollywood-ized version of the true story is crazier than the actual events which inspired it to begin with. That's not necessarily a good thing as "Tag" aims to be the next "Hangover," opting for style over substance, action over logic and as much laugh out loud humor as possible in favor of telling a more realistic depiction a group of friends who found a way to stay connected even as their lives took them in different directions over the years. For the month of May, every year, for thirty years, childhood best friends, the highly competitive Hogan "Hoagie" Malloy (Ed Helms), successful CEO Bob Callahan (Jon Hamm), the now divorced stoner Randy "Chilli" Cilliano (Jake Johnson), Kevin "Sable" Cheryl (Hannibal Buress) and Jerry Pierce (Jeremy Renner), play the game tag. Their longtime tradition is embraced by their friends and family and has been a long-running tradition which has always brought them together even when their lives have pushed them apart. And now, Jerry (Who has not once, ever been tagged) is getting married and finally calling it quits. Desperate to finally tag his quick, agile and resourceful friend, Hoagie gets the group back together along with his wife (Isla Fisher), who is not allowed to play because the boys determined years ago that no girls were allowed despite her ferocity and determination. The group is being documented by Rebecca Crosby (Annabelle Wallis), a Wall Street Journal journalist who is doing a story on Callahan but realizes that the larger story is the unusual and absurd child's game that these grown men will go through any lengths to play. All of the actors chosen for their respective parts within the group all function as expected and there is some genuine chemistry between the leads. Theis group of immature men feel like they have been friends for life, which is unbelievable when you consider that the story around them feels forced and fabricated as a means to sell tickets to the casual moviegoing audience who wants the next R-rated buddy group movie. The jokes are all over the place and never reach a consistent tone. Some jokes are witty one-liners, some are tongue in cheek, others are physical, some are sexual and a lot of them have characters commenting on how ridiculous the plot actually is to one another. Another issue is that female characters such as Hoagie's wife Anna, are absolutely wonderful and upstages the men at every turn but the screenplay feels the need to marginalize and regulate her to the sidelines. Same goes for Rashida Jones and Annabelle Wallis who feel forgotten by the screenplay for long chunks of screentime. It's not all bad though. If you can allow yourself to believe in the film's overly stylized premise, then you'll have an easier time submitting yourself over to the wild set pieces (Some of which draw influence from other films, most notably "Sherlock Holmes" when Jerry is contemplating how he plans to dodge his friends trying to tag him). Credit to "Silicone Valley" star Thomas Middleditch who has only one scene in the film as an employee of Jerry's gym and almost manages to steal the movie. 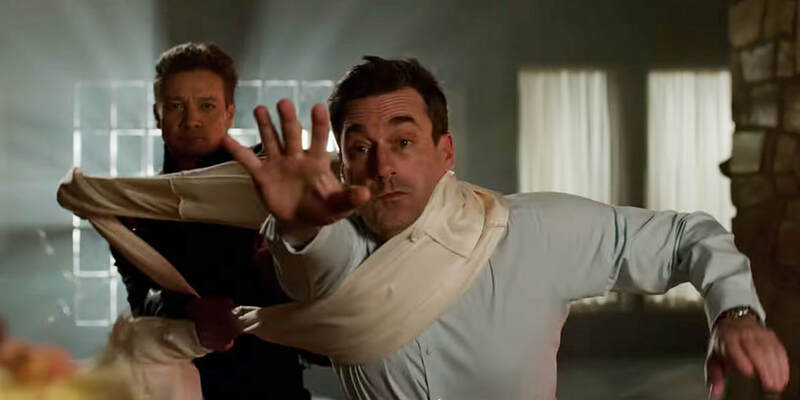 All in all, "Tag" is a silly and harmless time at the movies with more than a few gut-busting laughs to help carry you through the ludicrous plot of five grown men playing a child's game of tag with such planning, perseverance and skill. Surprisingly, there is a heartfelt message about growing old and the ties which bind us together despite the passage of time but you'll have to run, dodge and reach out to tag it.